91 min. A24. Director: Chad Hartigan. Cast: Markees Christmas, Craig Robinson, Carla Juri. One can take the scene literally as a look at paternal education, male bonding, and (developing) artistic taste. But Hartigan is also winking hard at his audience: my movie’s going to be minimal, so get on the beat. What follows is an amiable, gentle, light drama with coming-of-age and outsider elements. Thirteen-year-old Morris (Markees Christmas) hasn’t figured much out yet, and he’s entered the phase of surly-teen tendencies. Single-dad Curtis (Craig Robinson), a widower, does what he can to steer Morris right and stay connected as his son begins to develop his social persona amidst temptations. The hook alluded to in the title is that father and son, African-American expats clad in Yankees caps, live in the German town of Heidelberg for Curtis’ work as a soccer coach. Establishing shots make Heidelberg look like a clean, storybook idyll, but on the ground level, Morris struggles to know his role among his peers, girls, and two “girls” in particular: fifteen-year-old Katrin (Lina Keller) and Morris’ graduate-student German tutor Inka (Carla Juri). “I don’t need friends,” Morris insists, but he’s definitely responsive to female companionship. At the local youth center, Katrin initiates a flirty friendship with Morris that’s ambiguous, perhaps intentionally so. Meanwhile, Morris needily practices his own flirtation skills with Inka, who tries to maintain boundaries. Hartigan wisely keeps the stakes low, although for Morris they seem much higher. A talent show at the youth center provides a standard-issue opportunity for public embarrassment and/or acclaim, as Morris has to put up or shut up on his claim of being a rapper. Katrin tests waters, too, as a “bad girl” who smokes, does ecstasy, and is sexually active; it’s possible her infatuation with Morris, at least in part, fulfills this role she’s trying out (like most of the white characters, she harbors assumptions, based on Morris’ skin color, that mischaracterize and objectify him). Casual racism is just part of the film’s realistic texture, as are the subtle performances. Father and son share an easy rapport, but one threatened by adolescence. Christmas’ internal but resonant turn makes for an auspicious film debut, and a movingly attentive Robinson has never been allowed to be this warm on screen (Juri and Keller do sterling work as well). Hartigan’s “supporting” direction and “universal in the specific” approach go a long way to making a familiar, predictable story freshly poignant. As it ever was, here is adolescence—and, just as much, middle-aged parenting—as a path of fumbled longings, poor choices, and opportunities. Lionsgate sends Morris from America home in a Blu-ray + Digital HD special edition with strong A/V credentials and a solid collection of bonus features. The hi-def digital-to-digital transfer spells an aesthetic that's faithful to the source: color is true and rich, and detail and textures are sharply defined. Shadow detail and black level aren't always as impressive as the beautiful exteriors and well-lit interiors, but the latter type of shot proves far more prevalent. The lossless DTS-HD Master Audio mix is more than up to the task of recreating the theatrical experience, most impressively when it comes to thumping musical cues, but more importantly in putting across the dialogue with clarity and precision; some ambience in the back channels also enhances exteriors and crowd scenes. 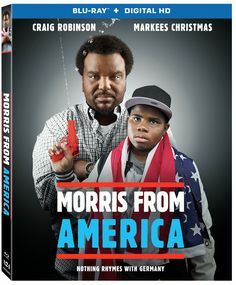 The Blu-ray offers an endearing audio commentary with director Chad Hartigan and actors Craig Robinson and Markees Christmas, who share laughs with each other while sharing with us screen-specific anecdotes about the production and the acting challenges of particular scenes, as well as memories of living in Heidelberg (including Robinson getting recognized). Video-based extras kick off with the EPK-style "Making Morris from America" (11:22, HD), featuring clips and interview snippets with Hartigan, Christmas, and Robinson. Rounding out the disc are "Bloopers" (2:35, HD), a "Deleted Scene" (1:18, HD), and "Casting Tapes" (4:28, HD) of Christmas and Lina Keller. All site content © 2000-2019 Peter Canavese. Page generated at 04/25/2019 02:36:29PM.